At the heart of Broodmother Skyfortress is one question. When you run an adventure does it have it lasting effects and so change elements of your campaign world? If the answer is no, then Broodmother Skyfortress may not be the adventure you are looking, but if the answer is yes, then get ready to run Broodmother Skyfortress and kick over the proverbial ant’s net. In this adventure, unimaginably alien creatures anchor their ship to the ground and descend from their sky to plunder and pillage, rampaging across the land. There are reports of an anchor dropping from the sky and ripping through buildings, of villages smashed, of centaurs, of strange boulders appearing from nowhere in formation, and more… From the first report, a trail of destruction can be tracked across the land and eventually to a cloud topped with a gold dome. What exactly is going on? It turns out that a brood of near-godlike beings that have the bodies of elephants and the heads of hammer head sharks have taken control of a giant magical fortress and have just enough brains to pilot it from one spot to the next where they descend to eat or take anything that they want. Can the adventurers ascend to the strange world above and discover what these creatures are and stop them? 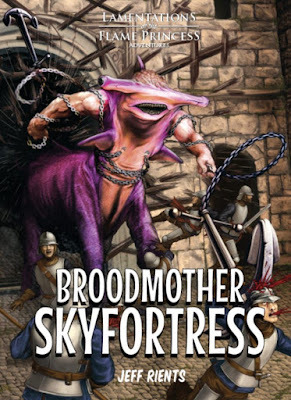 Funded by an IndieGoGo campaign and published by Lamentations of the Flame Princess, Broodmother Skyfortress is an adventure written by Jeff Rients—best known for Jeff’s Gameblog—for use with Lamentations of the Flame Princess Weird Fantasy Roleplay, released at DragonMeet, 2016, alongside the scenario, Blood in the Chocolate*. Actually getting there is not really the issue, although the Referee is free to throw in what encounters he likes along the way—especially encounters where the player characters’ favourite watering hole is found smashed—as they chase down the chaos and destruction that the fortress leaves in its wake… Once aboard, the adventurers need to sneak around both on and in the cloud to ferret out the cloud fortress’ secrets. Be warned, this is a tough adventure, suited to high level characters, although Broodmother Fortress does not specify any particular Levels. *Which for professional reasons I cannot review. Before the adventure begins though, the Referee needs to make two choices. The first is deciding what the brood giants are—space aliens? Angels? Mutants? Or actual shark-elephants? Then, who built the cloud-fortress—titans? Angels? Space gods? Real gods? These options are explored in some detail and their consequences examined, and this in addition to presenting each of the brood as an individual with different personalities, motivations, attacks, and more. All seven though—and there are just seven, which is enough!—share more or less the same stats and attack. They are the equivalent of twenty Hit Dice Fighters! Much like there is a Lamentations of the Flame Princess Weird Fantasy approach to firearms—once fired there is not enough time to reload in a melee, there is also a Lamentations of the Flame Princess Weird Fantasy approach to fighting giants. Simply, they have no Armour Class and there is no need to roll to hit to attack a giant as any missile or melee attack will always hit. The problem is getting past the giants’ damage reduction! Alternative stats are provided if the Referee really, really wants to make them dangerous. The dungeon consists of less than thirty locations divided between three areas, the fortress proper, the tunnels below the fortress, and the outbuildings. The fortress is home to the brood and means to power and steer the fortress; the tunnels to humans known as wretches who have been caught by the brood and despite having escaped have reverted to a primitive state; and the outbuildings to various ruins and features left behind by the skyfortress’ original builders and mostly ignored by the brood since. Each of the thirty or so locations is described in more than enough detail to intrigue the players and their characters, but even so, this barely takes up twenty pages. There are some fascinating things for them to find and play with—the Angry Brain of a Sky King, strange machinery, the nearly dead bodies of titans, and more. Besides the brood, the adventurers are likely to have difficulties with spider swarms, brood hatchlings, and spectral malevolences, things excreted by the Angry Brain, and possibly the Wretches, though there is also the possibility that the adventurers might form an alliance with them instead. Physically, Broodmother Skyfortress is stunning. Most of it is done in black and white, but where colour is needed, it is put to good effect. Such as the very nicely done maps positioned in the book’s endpapers along with the appropriate random encounter tables. The artwork though is fantastic, Ian MaClean’s illustrations not only being done in the style of Jack Kirby, but in some cases actually aping some of the great covers that Kirby drew for both Marvel and DC. In many cases, these star Jeff Rients and some may not be all that tasteful... In other places, the artwork is simply good, such as that depicting the Brood looting the Pyramids of Egypt or snapping off the head of the Statue of Liberty. Jeff Rients’ writing is also engaging and enjoyable, maintaining a light tone throughout. If there is an issue with Broodmother Skyfortress, it is that we do not have the medieval (or Early Modern) mind-set to play it effectively. Our contemporary exposure to the weird—whether from nature or from fiction a la H.P. Lovecraft—means that we have the means to categorise the weird and in doing so lessen its inherent difference. This starts with the cover. We look at the cover and we identify the scenario’s primary monster as being half-elephant, half-hammerhead shark and so we already know it and reduce the threat it represents. Nevertheless, Rients’ choice in combining elephants and hammerhead sharks is a nod to the medieval understanding of the world around them and how utterly alien and weird such creatures would be to them. Of course, Rients presents options in deciding what the Brood are, but part of the challenge in running and playing Broodmother Skyfortress is making that sense of the alien and the weird very much part of the scenario and the player characters. 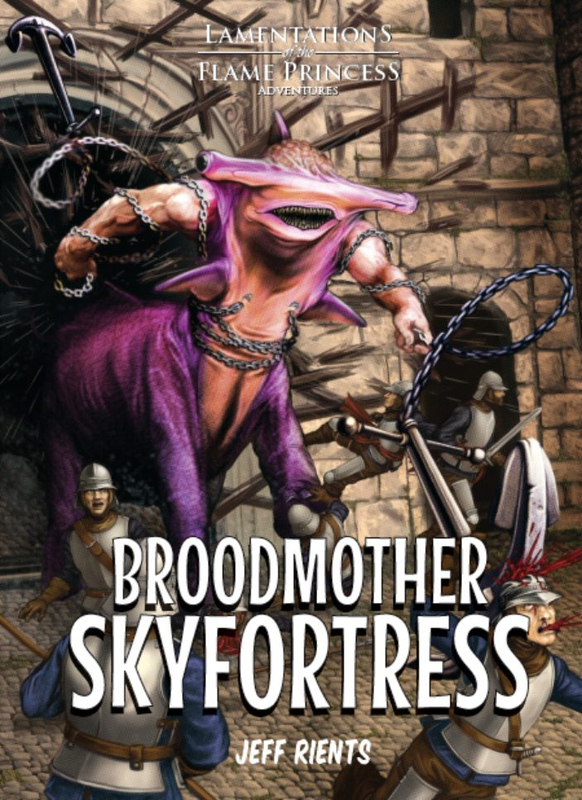 Broodmother Skyfortress is a great adventure in the mode of the G Series of modules of Advanced Dungeons & Dragons fame, but it goes beyond that series simply because it is not served up in aspic. If the adventurers do not stop the Brood, then they will go on looting and pillaging with abandon. This is a grand affair that brings a grandeur to the weird in Lamentations of the Flame Princess Weird Fantasy Roleplay and amongst the best releases for the retroclone to date. Just like the description of the skyfortress and its environs barely takes twenty or so pages, so the adventure Broodmother Skyfortress barely takes up more than half of the book. The other half reprints the very best of the articles and advice for the Referee that the author posts on his blog. There are fourteen of these in the book’s lengthy appendix, covering such diverse subjects as ‘What’s My Motivation?’ for recalcitrant players; ‘Twenty Quick Questions For Your Campaign Setting’ and ‘Old Schoolin’: How To Get Started’ for addressing the starting point for the Referee’s game; and ‘Grimoires of Wessex’ and ‘Wessex Henchmen/Hireling Rules’ for ideas from the author’s own campaign. There are also various rules variants and discussions of how to handle various aspects of the rules. Each is essentially a short article and worth reading whatever your level of experience in running Dungeons & Dragons and similar RPGs. In fact, Lamentations of the Flame Princess could have released Broodmother Skyfortress on its own and then a separate compendium of Rients’ posts and advice and that would have been good too. Perhaps there is still material enough for a Rients Compendium? If Broodmother Skyfortress is a very good adventure on its own, then the appendix of Jeff Rrients’ writings is a most welcome bonus. Together, they make Broodmother Skyfortress an impressive package that combines the weird with the old school.